Lucretius, the great Latin didactic poet. Our sole information concerning his life is found in the brief summary of Jerome, written more than four centuries after the poet's death. Jerome followed, often carelessly, the accounts contained in the lost work of Suetonius De Viris Illustribus, written about two centuries after the death of Lucretius; and, although it is likely that Suetonius used the information transmitted by earlier grammarians, there is nothing to guide us to the original sources. According to this account the poet was born in 95 BC; he became mad in consequence of the administration of a love-philtre; and after composing several books in his lucid intervals, which were subsequently corrected by Cicero, he died by his own hand in the forty-fourth year of his age. Donatus states in his life of Virgil, a work also based on the lost work of Suetonius, that Lucretius died on the same day on which Virgil assumed the toga virilis, that is, in the seventeenth year of Virgil's life, and on the very day on which he was born, and adds that the consuls were the same, that is Cn. Pompeius Magnus and M. Licinius Crassus, consuls in 70 and again in 55. The statements cannot be perfectly reconciled; but we may say with certainty that Lucretius was born between 98 and 95 BC, and died in 55 or 54. A single mention of his poem, the De rerum natura (which from the condition in which it has reached us may be assumed to have been published posthumously) in a letter of Cicero's to his brother Quintus, written early in 54 BC, confirms the date given by Donatus as that of the poet's death. The statements of Jerome have been questioned or disbelieved on the ground of their intrinsic improbability. They have been regarded as a fiction invented later by the enemies of Epicureanism, with the view of discrediting the most powerful work ever produced by any disciple of that sect. It is more in conformity with ancient credulity than with modern science to attribute a permanent tendency to derangement to the accidental administration of any drug, however potent. A work characterized by such strength, consistency and continuity of thought is not likely to have been composed "in the intervals of madness" as Jerome says. Donatus, in mentioning the poet's death, gives no hint of the act of suicide. The poets of the Augustan age, who were deeply interested both in his philosophy and in his poetry, are entirely silent about the tragical story of his life. Cicero, by his professed antagonism to the doctrines of Epicurus, by his inadequate appreciation of Lucretius himself and by the indifference which he shows to other contemporary poets, seems to have been neither fitted for the task of correcting the unfinished work of a writer whose genius was so distinct from his own, nor likely to have cordially undertaken such a task. Yet these considerations do not lead to the absolute rejection of the story. The evidence afforded by the poem rather leads to the conclusion that the tradition contains some germ of fact. It is remarkable that in more than one passage of his poem Lucretius writes with extraordinary vividness of the impression produced both by dreams and by waking visions. It is true that the philosophy of Epicurus put great stress on these, as affording the explanation of the origin of supernatural beliefs. But the insistence with which Lucretius returns to the subject, and the horror with which he recalls the effects of such abnormal phenomena, suggest that he himself may have been liable to such hallucinations, which are said to be consistent with perfect sanity, though they may be the precursors either of madness or of a state of despair and melancholy. Other passages, where he describes himself as ever engaged, even in his dreams, on his task of inquiry and composition, produce the impression of an unrelieved strain of mind and feeling, which may have ended in some extreme reaction of spirit, or in some failure of intellectual power, that may have led him to commit suicide. But the strongest confirmation of the tradition is the unfinished condition in which the poem has reached us. The subject appears indeed to have been fully treated in accordance with the plan sketched out in the introduction to the first book. But that book is the only one which is finished in style and in the arrangement of its matter. In all the others, and especially in the last three, the continuity of the argument is frequently broken by passages which must have been inserted after the first draft of the arguments was written out. Thus, for instance, in his account of the transition from savage to civilized life, he assumes at v. 1011 the discovery of the use of skins, fire, etc., and the first beginning of civil society, and proceeds at 1028 to explain the origin of language, and then again returns, from 1090 to 1160, to speculate upon the first use of fire and the earliest stages of political life. These breaks in continuity show what might also be inferred from frequent repetitions of lines which have appeared earlier in the poem, and from the rough workmanship of passages in the later books, that the poem could not have received the final revision of the author. Nor is there any great difficulty in believing that Cicero edited it; the word "emendavit", need not mean more than what we call "preparing for press." From the absence of any claim on the part of any other district of Italy to the honor of having given birth to Lucretius it is inferred that he was of purely Roman origin. No writer certainly is more purely Roman in personal character and in strength of understanding. His silence on the subject of Roman greatness and glory as contrasted with the prominence of these subjects in the poetry of men of provincial birth such as Quintus Ennius, Virgil and Horace, may be explained by the principle that familiarity had made the subject one of less wonder and novelty to him. The Lucretian gens to which he belonged was one of the oldest of the great Roman houses, nor do we hear of the name, as we do of other great family names, as being diffused over other parts of Italy, or as designating men of obscure or servile origin. It may well be assumed that Lucretius was a member of the Roman aristocracy, belonging either to a senatorian or to one of the great equestrian families. If the Roman aristocracy of his time had lost much of the virtue and of the governing qualities of their ancestors, they showed in the last years before the establishment of monarchy a taste for intellectual culture which might have made Rome as great in literature as in arms and law. A new taste for philosophy had developed among members of the governing class during the youth of Lucretius, and eminent Greek teachers of the Epicurean sect settled at Rome at the same time, and lived on terms of intimacy with them. The inference that Lucretius belonged to this class is confirmed by the tone in which he addresses Gaius Memmius, a man of an eminent senatorian family, to whom the poem is dedicated. His tone is quite unlike that in which Virgil or even Horace addresses Maecenas. He addresses him as an equal; he expresses sympathy with the prominent part he played in public life, and admiration for his varied accomplishments, but on his own subject claims to speak to him with authority. Although our conception of the poet's life is necessarily vague and meagre, yet his personal force is so remarkable and so vividly impressed on his poem, that we seem able to form a consistent idea of his qualities and characteristics. We know, for example that the choice of a contemplative life was not the result of indifference to the fate of the world, or of any natural coldness or even calmness of temperament. In the opening lines of the second and third books we can mark the recoil of a humane and sensitive spirit from the horrors of the reign of terror which he witnessed in his youth, and from the anarchy and confusion which prevailed at Rome during his later years. We may also infer that he had not been through his whole career so much estranged from the social life of his day as he seems to have been in his later years. Passages in his poem attest his familiarity with the pomp and luxury of city life, with the attractions of the public games and with the pageantry of great military spectacles. But much the greater mass of the illustrations of his philosophy indicate that, while engaged on his poem he must have passed much of his time in the open air, exercising at one the keen observation of a naturalist and the contemplative vision of a poet. He seems to have found a pleasure, more congenial to the modern than to the ancient temperament, in ascending mountains or wandering among their solitudes. References to companionship in these wanderings, and the well-known description of the charm of a rustic meal speak of kindly sociality rather than of any austere separation from his fellows. Other expressions in his poem imply that he was also a student of books. Foremost among these were the writings of Epicurus; but he had also an intimate knowledge of the philosophical poem of Empedocles, and at least an acquaintance with the works of Democritus, Anaxagoras, Heraclitus, Plato and the Stoical writers. 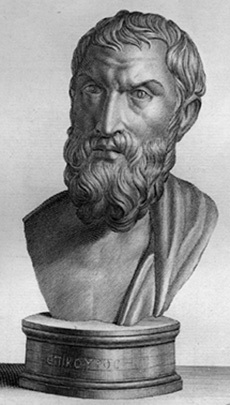 Of other Greek prose writers he knew Thucydides and Hippocrates; while of the poets he expresses in more than one passage the highest admiration of Homer, whom he imitated in several places. Next to Homer Euripides is most frequently reproduced by him. But his poetical sympathy was not limited to the poets of Greece. For his own countryman Quintus Ennius he expresses an affectionate admiration; and he imitates his language, his rhythm and his manner in many places. The fragments of the old tragedian Pacuvius and of the satirist Gaius Lucilius show that Lucretius had made use of their expressions and materials. In his studies he was attracted by the older writers, both Greek and Roman, in whose masculine temperament and understanding he recognized an affinity with his own. It is more difficult to infer the moral than the intellectual characteristics of a great writer from the personal impress left by him on his work. Yet it is not too much to say that there is no work in any literature that produces a more profound impression of sincerity. No writer shows a juster scorn of all mere rhetoric and exaggeration. No one shows truer courage, not marred by irreverence, in confronting the great problems of human destiny, or greater strength in triumphing over human weakness. No one shows a truer humanity and a more tender sympathy with natural sorrow. The peculiarity of the poem of Lucretius, that which makes it unique in literature, is that it is a reasoned system of philosophy, written in verse. The prosaic title De Rerum Natura implies the subordination of the artistic to a speculative motive. As in the case of nearly all the great works of Roman literary genius, the form of the poem was borrowed from the Greeks. The rise of speculative philosophy in Greece was coincident with the beginning of prose composition, and many of the earliest philosophers wrote in the prose of the Ionic dialect; others, however, and especially the writers of the Greek colonies in Italy and Sicily, expounded their systems in continuous poems composed in the epic hexameter. Most famous in connection with this kind of poetry are Xenophanes and Parmenides, the Eleatics and Empedocles of Agrigentum. The last was less important as a philosopher, but greater than the others both as a poet and a physicist. On both of these grounds he had a greater attraction to Lucretius. The fragments of the poem of Empedocles show that the Roman poet regarded that work as his model. In accordance with this model he has given to his own poem the form of a personal address, he has developed his argument systematically, and has applied the sustained impetus of epic poetry to the treatment of some of the driest and abstrusest topics. Many ideas and expressions of the Sicilian have been reproduced by the Roman poet; and the same tone of impassioned solemnity and melancholy seems to have pervaded both works. But Lucretius, if less original as a thinker, was probably a much greater poet than Empedocles. What chiefly distinguishes him from his Greek prototypes is that his purpose is rather ethical than purely speculative; the zeal of a teacher and reformer is more strong in him than even the intellectual passion of a thinker. His speculative ideas, his moral teaching and his poetical power are indeed interdependent on one another, and this interdependence is what mainly constitutes their power and interest. But of the three claims which he makes to immortality, the importance of his subject, his desire to liberate the mind from the bonds of superstition and the charm and lucidity of his poetry -- that which he himself regarded as supreme was the second. The main idea of the poem is the irreconcilable opposition between the truth of the laws of nature and the falsehood of the old superstitions. But, further, the happiness and the dignity of life are regarded by him as absolutely dependent on the acceptance of the true and the rejection of the false doctrine. In the Epicurean system of philosophy he believed that he had found the weapons by which this war of liberation could be most effectually waged. Following Epicurus he sets before himself the aim of finally crushing that fear of the gods and that fear of death resulting from it which he regards as the source of all the human ills. Incidentally he desires also to purify the heart from other violent passions which corrupt it and mar its peace. But the source even of these -- the passions of ambition and avarice -- he finds in the fear of death; and that fear he resolves into the fear of eternal punishment after death. The selection of his subject and the order in which it is treated are determined by this motive. Although the title of the poem implies that it is a treatise on the whole nature of things, the aim of Lucretius is to treat only those branches of science which are necessary to clear the mind from the fear of the gods and the terrors of a future state. In the two earliest books, accordingly, he lays down and largely illustrates the first principles of being with the view of showing that the world is not governed by capricious agency, but has come into existence, continues in existence, and will ultimately pass away in accordance with the primary conditions of the elemental atoms which, along with empty space, are the only eternal and immutable substances. These atoms are themselves infinite in number but limited in their varieties, and by their ceaseless movement and combinations during infinite time and through infinite space the whole process of creation is maintained. In the third book he applies the principles of the atomic philosophy to explain the nature of the mind and vital principle, with the view of showing that the soul perishes with the body. In the fourth book he discusses the Epicurean doctrine of the images, which are cast from all bodies, and which act either on the senses or immediately on the mind, in dreams or waking visions, as affording the explanation of the belief in the continued existence of the spirits of the departed. The fifth book, which has the most general interest, professes to explain the process by which the earth, the sea, the sky, the sun, moon and stars, were formed, the origin of life, and the gradual advance of man from the most savage to the most civilized condition. All these topics are treated with the view of showing that the world is not itself divine nor directed by divine agency. The sixth book is devoted to the explanation, in accordance with natural causes, of some of the more abnormal phenomena, such as thunderstorms, volcanoes, earthquakes, etc., which are special causes of supernatural terrors. The consecutive study of the argument produces on most readers a mixed feeling of dissatisfaction and admiration. They are repelled by the dryness of much of the matter, the unsuitableness of many of the topics discussed for poetic treatment, the arbitrary assumption of premises, the entire failure to establish the connection between the concrete phenomena which the author professes to explain and these assumptions, and the erroneousness of many of the doctrines which are stated with dogmatic confidence. On the other hand, they are constantly impressed by his power of reasoning both deductively and inductively, by the subtlety and fertility of invention with which he applies analogies, by the clearness and keenness of his observation, by the fulness of matter with which his mind is stored, and by the consecutive force, the precision and distinctness of his style, when employed in the processes of scientific exposition. The first two books enable us better than anything else in ancient literature to appreciate the boldness and, on the whole, the reasonableness of the ancient mind in forming hypotheses on great matters that still occupy the investigations of physical science. The third and fourth books give evidence of acuteness in psychological analysis; the fourth and sixth of the most active and varied observation of natural phenomena; the fifth of original insight and strong common sense in conceiving the origin of society and the progressive advance of man to civilization. But the chief value of Lucretius as a thinker lies in his firm grasp of speculative ideas, and in his application of them to the interpretation of human life and nature. All phenomena, moral as well as material, are contemplated by him in their relation to one great organic whole, which he acknowledges under the name of "Natura daedala rerum", and the most beneficent manifestations of which he seems to symbolize and almost to deify in the "Alma Venus", whom, in apparent contradiction to his denial of a divine interference with human affairs, he invokes with prayer in the opening lines of the poem. In this conception of nature are united the conceptions of law and order, of ever-changing life and interdependence, of immensity, individuality, and all-pervading subtlety, under which the universe is apprehended both by his intelligence and his imagination. Nothing can be more unlike the religious and moral attitude of Lucretius than the old popular conception of him as an atheist and a preacher of the doctrine of pleasure. It is true that he denies the doctrines of a supernatural government of the world and of a future life. But his arguments against the first are really only valid against the limited and unworthy conceptions of divine agency involved in the ancient religions; his denial of the second is prompted by his vital realization of all that is meant by the arbitrary infliction of eternal torment after death. His war with the popular beliefs of his time is waged, not in the interests of license, but in vindication of the sanctity of human feeling. The cardinal line of the poem, "Tantum religio potuit suadere malorum", is elicited from him as his protest against the sacrifice of Iphigenia by her father. But in his very denial of a cruel, limited and capricious agency of the gods, and in his imaginative recognition of an orderly, all-pervading, all-regulating power, we find at least a nearer approach to the higher conceptions of modern theism than in any of the other imaginative conceptions of ancient poetry and art. But his conception even of the ancient gods and of their indirect influence on human life is more worthy than the popular one. He conceives of them as living a life of eternal peace and exemption from passion, in a world of their own; and the highest ideal of man is, through the exercise of his reason, to realize an image of this life. Although they are conceived of as unconcerned with the interest of our world, yet influences are supposed to emanate from them which the human heart is capable of receiving and assimilating. The effect of unworthy conceptions of the divine nature is that they render a man incapable of visiting the temples of the gods in a calm spirit, or of receiving the emanations that "announce the divine peace" in peaceful tranquillity. The supposed "atheism" of Lucretius proceeds from a more deeply reverential spirit than that of the majority of professed believers in all times. His moral attitude is also far removed from that of ordinary ancient Epicureanism or of modern materialism. Though he acknowledges pleasure to be the law of life, yet he is far from regarding its attainment as the end of life. What man needs is not enjoyment, but peace and a pure heart. The victory to be won by man is the triumph over fear, ambition, passion, luxury. With the conquest over these nature herself supplies all that is needed for happiness. Self-control and renunciation are the lessons which he preaches. It has been doubted whether Cicero, in his short criticism in the letter already referred to, concedes to Lucretius both the gifts of genius and the accomplishment of art or only one of them. Readers of a later time, who could compare his work with the finished works of the Augustan age, would certainly disparage his art rather than his power. But with Cicero it was different. He greatly admired, or professed to admire, the genius of the early Roman poets, while he shows indifference to the poetical genius of his younger contemporaries. Yet he could not have been insensible to the immense superiority in rhythmical smoothness which the hexameter of Lucretius has over that of Ennius and Lucilius. And no reader of Lucretius can doubt that he attached the greatest importance to artistic execution, and that he took a great pleasure, not only in "the long roll of his hexameter", but also in producing the effects of alliteration, assonance, etc., which are so marked a peculiarity in the style of Plautus and the earlier Roman poets. He allows his taste for these tricks of style to degenerate into mannerism. And this is the only drawback to the impression of absolute spontaneity which his style produces. He was unfortunate in living before the natural rudeness of Latin art had been successfully grappled with. His only important precursors in serious poetry were Ennius and Lucilius, and, though he derived from the first of these an impulse to shape the Latin tongue into a fitting vehicle for the expression of elevated emotion and imaginative conception, he could find in neither a guide to follow in the task he set before himself. The difficulty and novelty of his task enhances our sense of his power. His finest passages are thus characterized by a freshness of feeling and enthusiasm of discovery. But the result of these conditions and of his own inadequate conception of the proper limits of his art is that his best poetry is clogged with a great mass of alien matter, which no treatment in the world could have made poetically endurable.